Santa Rally - every year or not? Every year at some time in December, in the lead up to the Christmas period, there tends to be a discussion about a possible Santa Rally in the weeks ahead. But what is a Santa Rally? Does it happen every year? Or perhaps in many years? Is it likely to happen again in the next Christmas New Year period? When it occurs, how long does it last? Is it really just a 7-day window at about Christmas time? These questions and more are covered in this edition of the eNews Update. 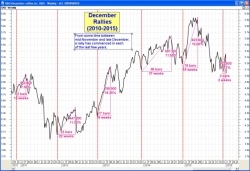 I first posted my Santa Rally web page in the Toolbox in 2013, with some charts and observations about possible Santa Rallies - depending on your definition for a Santa Rally. For this edition of the eNews I have written three new eBook (PDF) Articles with 14 price charts of the index over a total of 15 pages. The information is similar to the content of the Santa Rally web page, but it's in a nice printable format and with extra observations and comments. See all the details in this edition's focus section below. And please do have a Merry Christmas and Happy New Year. When I was doing the research for this edition of the eNews, and studying the charts of the Australian market index, I stepped back and realised that in the last five years the market has rallied at least 7 percent over at least a 12 week period starting at some time between mid-November and mid-December. This is shown in the chart at right which is now posted on the Santa Rally web page (Toolbox Members click on the chart for a larger image). Please note that this is NOT a guarantee (nor even a suggestion) that the rally will occur again this year, nor in any other year to come. It is simply an observation of what's happened in the past. If it ever happens again, we should not be surprised. eBook Article ST-6320, "Santa Rally - Introduction" - This new 4-page article provides the background behind the notion of the term Santa Rally and offers some discussion about why the term might be in common use today. eBook Article ST-6325, "Santa Rally - Yale Hirsch charts" - This new 5-page article considers whether a Santa Rally occurred in the seven years of this study, as per Yale Hirsch's original definition. eBook Article ST-6330, "Santa Rally - More charts" - This new 6-page article includes price charts showing that in many of the years in question, a rally occurred over several weeks at some time during the December-January period.